A little over a year ago, a Youtube redemption gamer came across a location test for a videmption title known as Tight Rope. It wasn’t clear who was making it from the video but I assumed Andamiro given the style and that it was testing in California. We had thought that the game might show up at IAAPA 2016 or Amusement Expo 2017. But it appeared at neither, leaving us unsure as to it’s fate. With its high-definition graphics simulating views from various highwire adventures and its moving obstacles that increase the challenge, Andamiro’s Tight Rope will immerse gamers and test their reaction skills. Most of all, Tight Rope will entertain players of all ages. 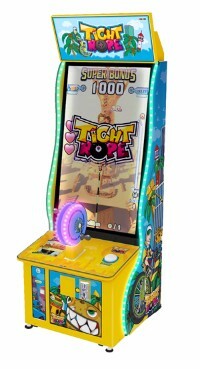 Tight Rope offers three courses — strung over a city, islands or ancient ruins — whose aerial themes are complemented by dramatic video scenery and gameplay. The object of the game is to complete one of the 600-foot courses to win a super bonus. The game’s main components are a pedal-style controller (like a crank axel on a unicycle), which controls the speed of the daredevil unicyclist, and a large vertical monitor. Players grip the bars on the controller with both hands to pedal their unicyclist along the wire. The pedal controller vibrates to amplify the sensation of riding a unicycle across a highwire. From the details above, what do you think about this game?